The Alerts List gathers and displays all of the required phone calls for clients / employees, as well as the open tasks of the user and the meetings for the current day. The alerts in this window are displayed according to the "Enable Alerts" field definitions, in the Employee Card, which allows to select the required activities for the alerts. Clients / Suppliers - These tabs display the phone calls the should be done in the current day. The first table in this tab displays the phone calls that have been set for a specific hour, as defined in the Relationship tab. The second table displays phone calls for the current day that do not have specific hour. 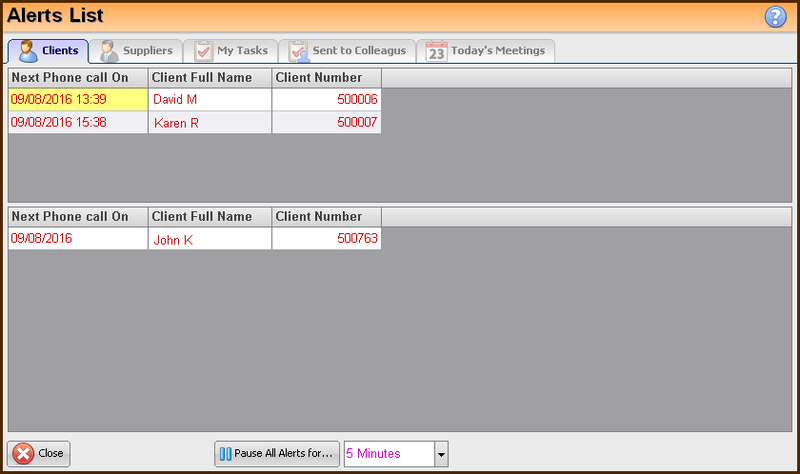 Double click on a phone call record will open the Client / Supplier card. My Tasks / Sent To Colleagues - This tab displays the tasks of the user that have been created for himself / for colleagues, and have a deadline of the current day. Double click on a meeting record will open the task window. Today's Meetings - This tab displays the list of meetings for the current day. Double click on a meeting record to display the "Edit Meeting" window. At the bottom of this window, the user can define the timing of the alerts. Choose the required timing and press the Pause All Alerts for button.